A part of the local market in Payangan (made with a Samyang 7.5mm fisheye). 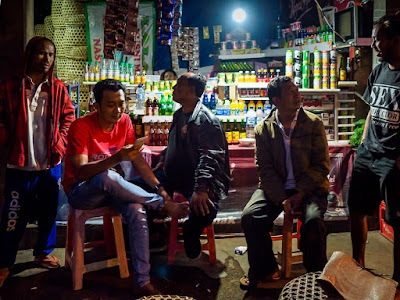 If you're in Bali and you wake up at 4AM and can't get back to sleep, I can't imagine a better way to spend the predawn hours than going to a local market. Bali's local markets are lively places that serve as much as a community gathering as a shopping destination. 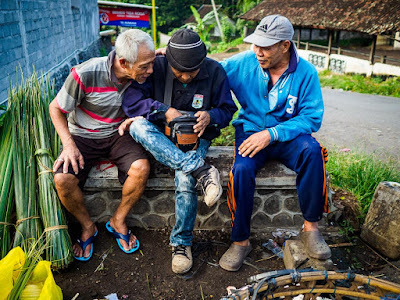 Men have breakfast and check their smart phones in the Bringkit market, about 30 minutes from Denpasar. Markets in Asia are kind of a tourist trope. In Bangkok, tourists have a regular route of the weekend market, a floating market (there are many), the flower market and so on. And almost all of them are tourist traps. (The flower market is a "real" market between 4AM and 8AM but switches over to mostly tourists around 8AM.) The floating markets, in particular, are notorious tourists traps. There are a couple of "real" markets in Bangkok, especially Khlong Toei Market, but you have to get to there early to see them in full swing. But early in Bangkok is between 5.30AM and 6AM. And things slow down between 8AM and 9AM. Early in Bangkok is nothing compared to early in Bali though. Tourists in Bali go to the markets in Ubud, Kuta, Denpasar and look at the colorful batiks, the ukuleles and sunglasses. 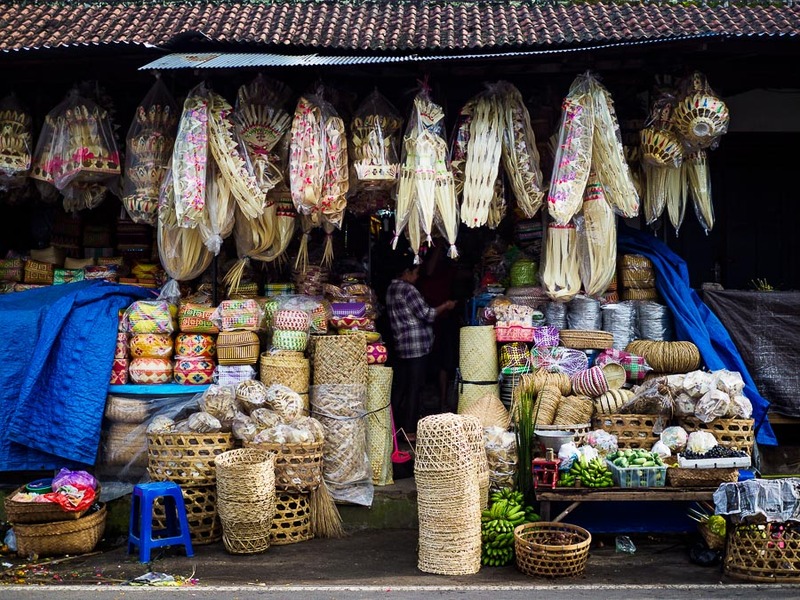 They spend a lot of money on souvenirs of their Bali holiday but they don't see the real markets of Bali. Shopping for bananas in Payangan. In Bali, the local markets open between 3AM and 3.30AM and hit their peak about 4AM. 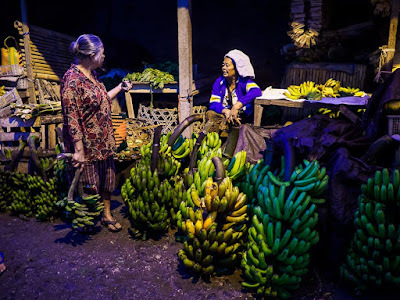 In Ubud's local market, the venders who sell fruit and produce to local people pack up and leave between 7.30 and 8AM, to be replaced by venders selling tourists' kitsch by 8AM, just as the tourists are rolling away from their hotel breakfast buffets. In a lot of the less touristy places though this isn't the case. When their markets close, they close. Drive by at 9AM and it's deserted. Drive by at 5AM and it's swarming with people. Shoppers in the Payangan market. I don't want to sound the death knell of local markets in Asia, but they are facing an uncertain future. In Thailand, for example, (the place I know best) there are now modern grocery stores in almost every town of any size. Pick them up and drop them whole into an American suburb and shoppers would be hard pressed to tell the difference from their local Safeway or Kroger's. As Thailand has industrialized and become more middle class, people have gone from shopping in markets to shopping in grocery stores. Increasingly, it's just working poor (and restaurateurs who want the freshest ingredients) who use the markets. Grocery stores have not invaded Bali though. There are a couple in Ubud and Denpasar but most of the people who shop in them are expats and retirees who opted for life in the slow lane. But so slow that they want to give up their grocery stores. At the Bringkit livestock market men haggle over the price of a Bali cow. The Bali cow is a domesticated form of banteng (wild cattle). You see them everywhere in rural Bali. Because venders travel from market to market, Bali's local markets are usually open on every three day rotating schedules. 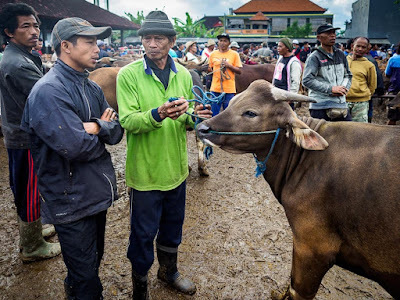 The local market in Ubud is open every day at 4AM and the Bringkit livestock market is Sundays only, but otherwise your chance of stumbling upon an open local market depends largely on luck or getting the market schedule. Some of the local markets are well known for one or two products. In Bringkit it's livestock. In Bebandem it's baskets. 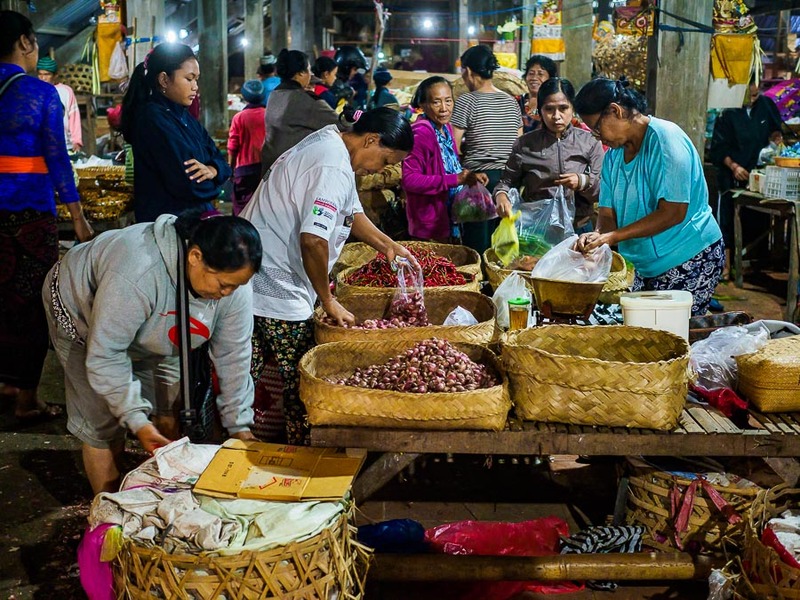 The Bebandem market is about 30 minutes from the tourist beaches along Candidasa Road, on the far eastern end of Bali. You wouldn't know that if you were in the market. 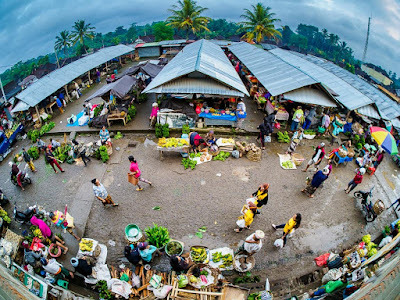 It's a great sprawling market in the mountains above the Bali Sea and tourists seldom journey up to it. Still in Bebandem, men chat. The man in the middle was selling live chickens. 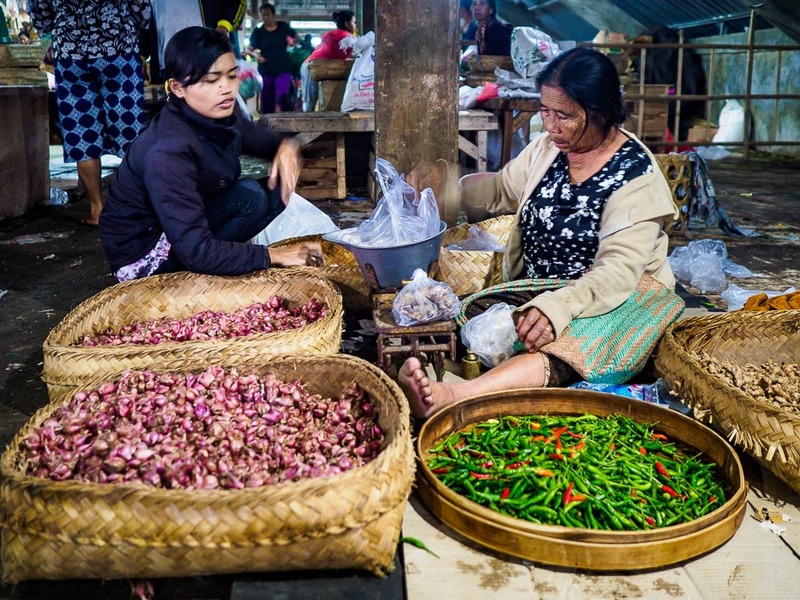 Bali's local markets are a reflection of life on the island. 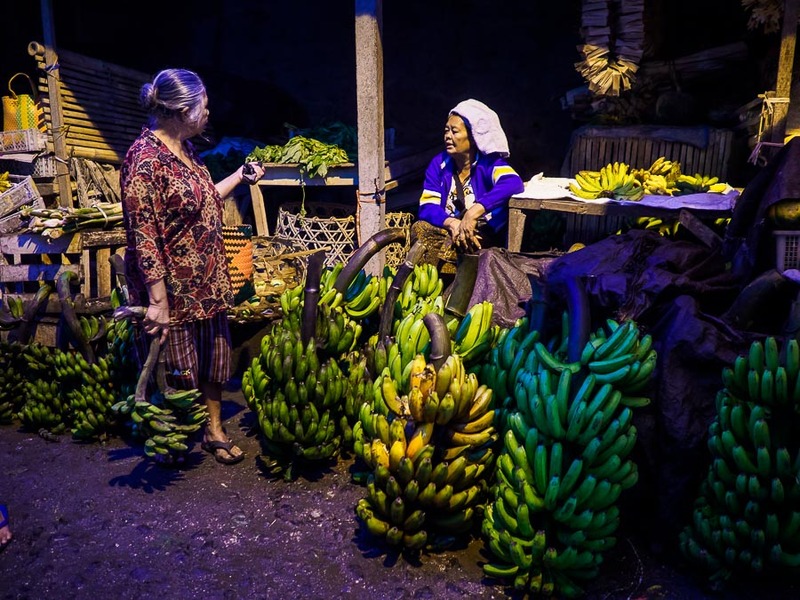 In a place frequently described as paradise, the bounty of Bali's fields are on full display in the markets. Buying chillies and garlic in the Payangan market. Bali's spiritual side is also well represented in the markets. Many markets have a temple (Ubud's market temple is especially easy to find) and almost every Hindu owned shop in the markets has a small shrine where offerings are made throughout the day. 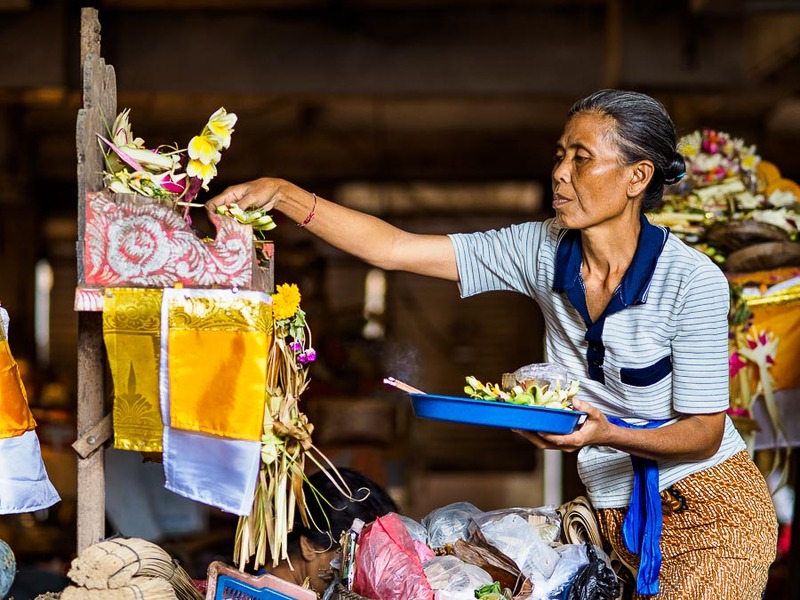 A woman makes an offering in a shrine in her shop in the Sukawati market. There are many more photos of Bali's local markets in my archive or available from ZUMA Press.